Urgent government measures and increased public and private investment in the seed sector are required for the long term if agriculture is to meet the challenge of food security in the context of population growth and climate change. Governments are strongly encouraged to implement a predictable, reliable, user friendly and affordable regulatory environment to ensure that farmers have access to high quality seed at a fair price. 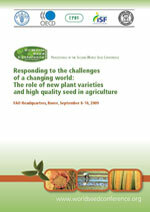 In particular, FAO member countries are urged to participate in the internationally harmonized systems of the Organization for Economic Cooperation and Development (OECD), the International Union for the Protection of New Varieties of Plants (UPOV), the International Treaty on Plant and Genetic Resources for Food and Agriculture (ITPGRFA) and the International Seed Testing Association (ISTA). Participation in those systems will facilitate the availability of germplasm, new plant varieties and high quality seed for the benefit of their farmers, without which their ability to respond to the challenges ahead will be substantially impaired. The conference emphasized the important role of both the public and the private sectors to meet the challenges ahead and the benefits when the two work together. The designations employed and the presentation of material in this information product do not imply the expression of any opinion whatsoever on the part of the Food and Agriculture Organization of the United Nations or its partners concerning the legal or development status of any country, territory, city or area or of its authorities, or concerning the delimitation of its frontiers or boundaries. The views expressed in this publication are those of the authors and do not necessarily reflect the views of the Food and Agriculture Organization of the United Nations or its partners. The conclusions given in this report are considered appropriate at the time of its preparation.